The Sitting Volleyball Experience | Talented Young Athletes, Famous Olympians and a Duchess! Talented Young Athletes, Famous Olympians and a Duchess! It’s certainly not everyday you get to coach volleyball to a selection of Great Britain’s finest Olympians or to witness a future Queen playing Volleyball, but today was a day I got to do both! I was down at the Queen Elizabeth Olympic Park delivering with Volleyball England at the SportsAid Athlete workshop. SportsAid are a fantastic charity that provide funding to talented young and developing athletes to support them with the costs of training and competing. Over the years they have supported a number of volleyball athletes in all formats of the game. Having set up the court and got everything ready we began delivering to our first group of young athletes. Many of the young people had never played volleyball before but they soon got the hang of it and were soon able to master the volley and other basic techniques they needed. I did some sitting volleyball work with a young swimmer who wasn’t able to play the standing game and despite her claims that she wasn’t any good at ball sports, she soon got to grips with it and we achieved some lengthy rallies. Whilst we were playing we were joined by our first Olympians of the day, Swimmers Steve Parry (Olympic Bronze medalist) and Karen Pickering (4 Time World Champion) who soon got involved, volleying as a pair and playing in matches with the young people. Our second session was even better – having introduced the game to another group of SportsAid athletes we soon got playing and were then joined by Olympic Rowing legends Katherine Grainger (London 2012 Olympic Gold medalist) and Steve Williams (2 times Olympic Gold medalist). They were both very keen to get involved and to prove they were better than Steve and Karen. Offering coaching points to such famous athletes was very surreal but also very special! It was midway through this session that her Royal Highness the Duchess of Cambridge arrived at the venue and was soon being shown around the sports. Having briefly watched and chatted to players and coaches from the other sports, she arrived at Volleyball and was keen to have a go! 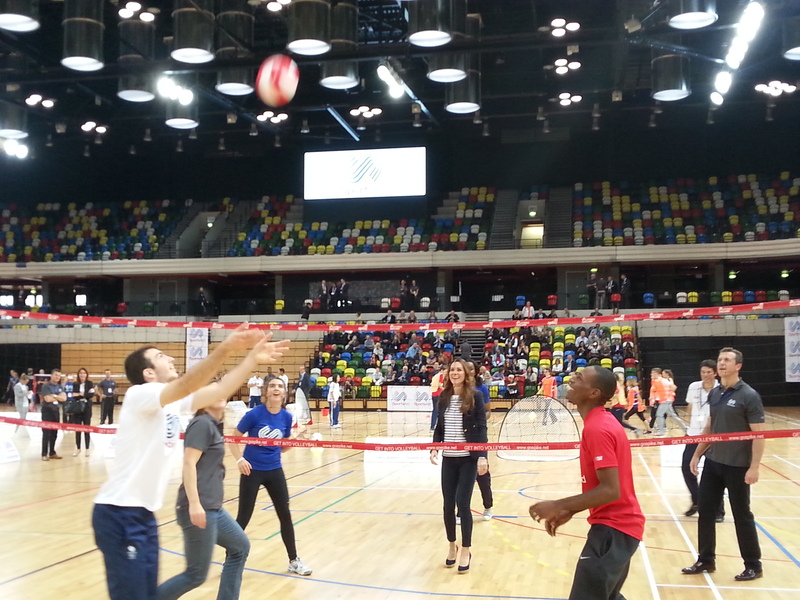 We set up a 4 v 4 game with the Olympians, the Duchess and some of England’s most promising junior volleyball players. With the worlds media watching Kate got stuck in, smiling and enjoying herself. Once the Duchess had left we continued to play and delivered 2 more sessions to groups of young people. I was then asked to do an interview with the Daily Telegraph to analyse her technique, assessing what she had done well and what she could do to improve! This turned into one of the many articles that were published around the world showing her playing volleyball in her first public engagement since the birth of Prince George. Overall it was a fantastic event that hopefully inspired the SportsAid athletes to continue to work hard in their chosen sports.